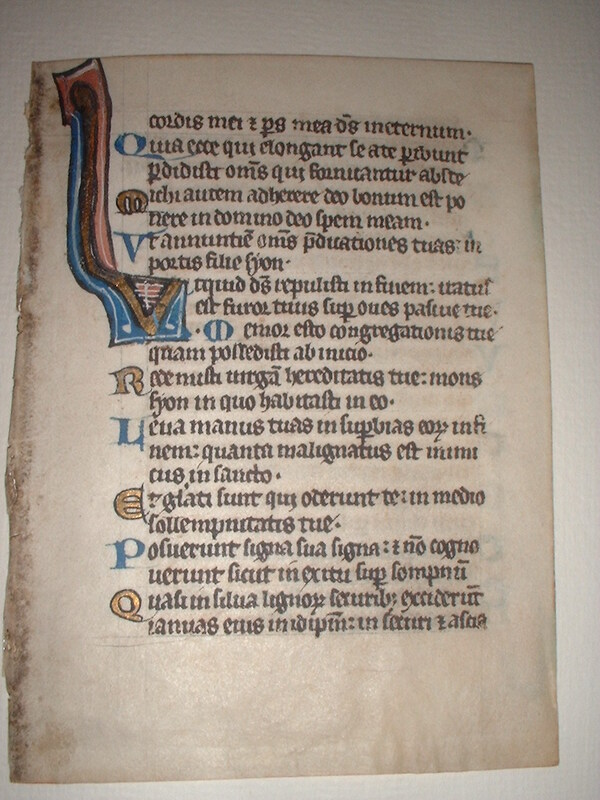 Text: Psalms 72:26-73:6 (recto) and 73:6-16 (verso). Reconstruction Note! 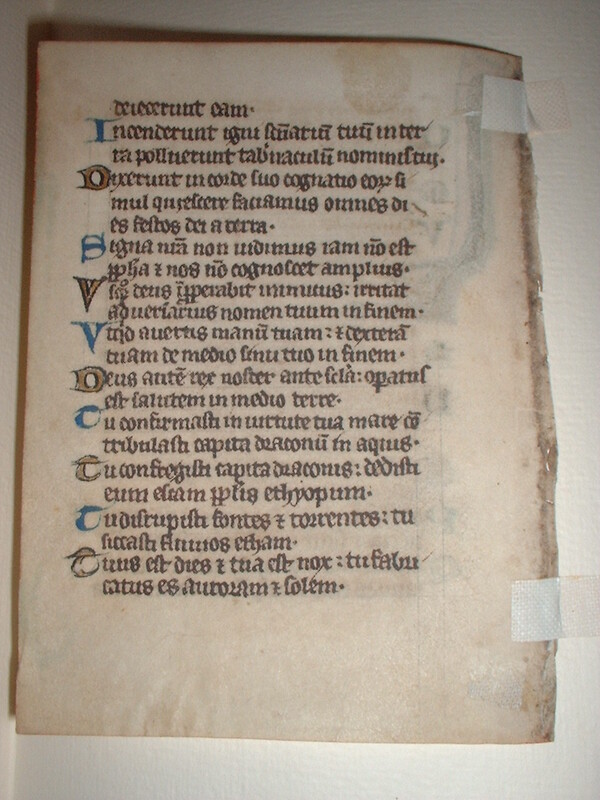 In Ege's original manuscript, this leaf followed what is now Leaf 12 in the Ohio State University portfolio. Together they contain the text of Psalms 71:5-73:16.
cordis mei, et pars mea, Deus in ætérnum. Quia ecce qui elóngant se a te períbunt; perdidísti omnes qui fornicántur abs te. Vt annúntiem omnes prædicatiónes tuas in portis fíliæ Sion. Vt quid, Deus, repulísti in finem, irátus est furor tuus super oves páscuæ tuæ? Memor esto congregatiónis tuæ, quam possedísti ab inítio. Redemísti virgam hæreditátis tuæ, mons Sion, in quo habitásti in eo. Leva manus tuas in supérbias eórum in finem: quanta malignátus est inimícus in sancto! Posuérunt signa sua, signa: et non cognovérunt sicut in éxitu super summum. ...of my heart, and the God that is my portion for ever. 27 For behold they that go far from thee shall perish: thou hast destroyed all them that are disloyal to thee. 28 But it is good for me to adhere to my God, to put my hope in the Lord God: That I may declare all thy praises, in the gates of the daughter of Sion. Incendérunt igni sanctuárium tuum; in terra polluérunt tabernáculum nóminis tui. Dixérunt in corde suo cognátio eórum simul: Quiéscere faciámus omnes dies festos Dei a terra. Signa nostra non vídimus; jam non est prophéta; et nos non cognóscet ámplius. Vsquequo, Deus, improperábit inimícus? irrítat adversárius nomen tuum in finem? Vt quid avértis manum tuam, et déxteram tuam de médio sinu tuo in finem? Deus autem rex noster ante sǽcula: operátus est salútem in médio terræ. Tu confirmásti in virtúte tua mare; contribulásti cápita dracónum in aquis. Tu confregísti cápita dracónis; dedísti eum escam pópulis Æthíopum. Tu dirupísti fontes et torréntes; tu siccásti flúvios Ethan. Tuus est dies, et tua est nox; tu fabricátus es auróram et solem. ...brought it down. 7 They have set fire to thy sanctuary: they have defiled the dwelling place of thy name on the earth. 8 They said in their heart, the whole kindred of them together: Let us abolish all the festival days of God from the land. 9 Our signs we have not seen, there is now no prophet: and he will know us no more. 10 How long, O God, shall the enemy reproach: is the adversary to provoke thy name for ever? 11 Why dost thou turn away thy hand: and thy right hand out of the midst of thy bosom for ever ? 12 But God is our king before ages: he hath wrought salvation in the midst of the earth. 13 Thou by thy strength didst make the sea firm: thou didst crush the heads of the dragons in the waters. 14 Thou hast broken the heads of the dragon: thou hast given him to be meat for the people of the Ethiopians. 15 Thou hast broken up the fountains and the torrents: thou hast dried up the Ethan rivers. 16 Thine is the day, and thine is the night: thou hast made the morning light and the sun.